“Seeking and acquiring basic religious knowledge is a personal obligation of every believer, whether male or female. It is very important for women to understand it. We are happy to see that women of this community pay due attention to this matter and desire to deepen their religious knowledge. From our side, we will to help them, visit them repeatedly to share our experience with teachers and spend a good time in the company of the sisters.” – say organizers of the event. 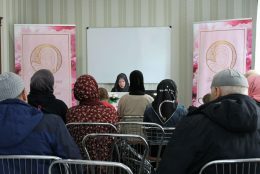 The lecture was held in Sumy mosque “Barakat” with the city community support under the Association programme “Muslim woman and Dawat”.